A relative passes away and leaves his property to you, but you are not sure what to do next. Claiming inherited property should be an easy process, in which the court or the estate representative makes sure that you get a chance to claim your inherited property. However, in cases in which the deceased person left you as his heir but you didn't receive a notice that the estate is in probate, you may need to take the first step and file a demand. 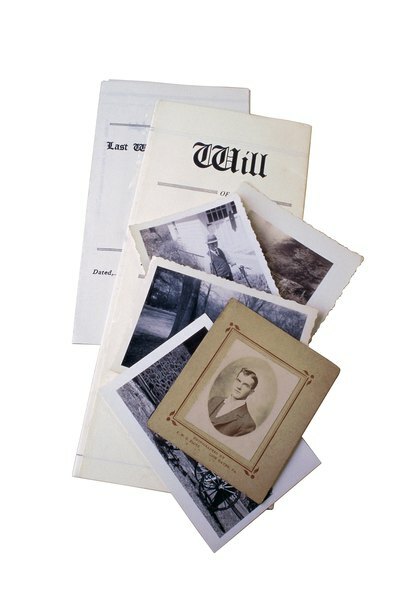 Discuss your inherited property with the estate's personal representative. You must know certain facts about the property before you can claim it. First, you must know whether you are the sole recipient of the property you've inherited, or if you are inheriting it jointly with anyone else. Second, you must know whether the deceased owned the property free and clear, or if the property was financed. Decide what you want do with the property. If you have inherited real property that is financed, you have to refinance before you can take the title. If you are inheriting jointly, all heirs of that property need to decide on what they want to do with their interests. Whoever decides to retain ownership or partial ownership must refinance the outstanding loan in his name. The personal representative may be able to direct you to a financial expert who deals with refinancing inherited property. If joint heirs cannot decide on who will retain ownership, or if the heir cannot qualify for financing, the personal representative needs to sell the property and distribute any proceeds to the heirs after all estate debt is satisfied. Vehicles with outstanding auto loans may present a similar problem. In Maryland, for example, the lien holder must agree in writing to transfer the title to an heir, even if the heir already owned the property jointly with the deceased. Arrange a time to meet with the personal representative so that he can transfer the title of the inherited property to you. Bring identification and all the paperwork that the probate court requires, such as refinancing paperwork for real property, or in the case of an auto, a letter of consent from the auto lien holder who agrees to transfer the title to you. Present the required paperwork from the refinancing financial institutions and auto lien holders to the estate representative and execute any deed or title presented to you. Take physical possession of the property or of any keys to the property. Often, the personal representative takes care of filing deeds and titles with the appropriate office. Have a check drawn on estate proceeds, made out to you and signed by the personal representative, to satisfy any cash inheritance. File the Demand with the probate court after the probate proceeding has started. From that point on, you should receive notice of every hearing or meeting concerning the estate and the completion of probate. File a Demand for Notice with the probate court, when you know you are an heir of a deceased's estate, but you have not been notified of or included in the probate proceedings. A Demand for Notice is document that forces the probate court to recognize you as an heir of the estate and include you in any proceedings, meetings and most importantly, property distribution. Maine, Michigan and Arizona are among the few states whose statutes provide for a Demand for Notice. Forms are usually available from the probate court, if you don't have an attorney. Complete the form, using the case number assigned to the probate proceeding. Alternatively, you can use an online legal document provider to help you draw up a Demand for Notice. The Demand will require information such as your name and contact information, an explanation of your relationship with the deceased or the estate and a description of the property you expect to inherit. Use the case number that the probate court assigned to the proceeding associated with the estate for which you are an heir. This case number tells the probate court clerk which proceeding to file the Demand for Notice. File the Demand for Notice with the probate court, and retain a file-stamped copy for your records. Mail file stamped copies of the Demand to the personal representative and all known heirs of the estate or their attorneys. Attend any proceedings or meetings associated with the probate court you received notice of after filing the Demand for Notice. After filing the Demand for Notice and being included in the probate proceeding by the court and the personal representative, proceed as would any other heir. Respond to any questions or requests that the personal representative has, and claim any inherited property, as described above.